In 2017, the likelihood that you are going to meet your end at the hands of a natural disaster is high. Rapidly changing weather patterns due to climate change and ever shifting tectonic plates put Earth on the precipice of a real world reenactment of the movie 2012. Though the reality of natural disasters is not as sensational or entertaining as it seems in the movies, they are becoming more and more frequent and devastating. In recent months, everyone from Florida to Mexico to even Southern Oregon have experienced disaster in ways we haven’t seen in years, so follow me as I take you on a journey through the first act in the world’s descent into climate chaos. Southern Oregon has been experiencing some of the worst smog and smoke on record. At least it would seem so if you talked to one of my many peers that seem to believe the world is ending. The abundance of devastating wildfires as well as Ashland’s placement in the center of a climate inversion zone lend to the painfully thick sheen of smog that smothered the valley during late summer and early fall. The precipitation and temperature shift near the end of September led to the smoke clearing; however, 2017 is the hottest year on record second only to 2016, according to independent analyses by NASA and NOAA. In short, the conditions under which these fires start and burn best are getting worse for the Valley’s population and better for the fires. According to the New York State Department of Health, exposure to smoke and ash particulates can cause angina, alter lung function and acute bronchitis which is treatable, but extended exposure to ash and particulates can lead to chronic bronchitis which is a debilitating cough that can last for years. Being surrounded by an (almost) literal tinder forest waiting to be set alight will continue to put everyone in the Rogue Valley at risk. Despite the fact that residents of Ashland may end up smothering to death before the year is out, Ashland’s friends down South are experiencing tragedy in ways we could never imagine. From August 30 to September 14, Florida was ravaged by Hurricane Irma. The death toll continues to rise and the damages are in the trillions of dollars. For Barbuda alone, the preliminary estimate for rebuilding is $300 million, which represents more than 20 percent of the country’s GDP, according to the island’s governor Rodney Williams. Soon after Irma hit land Hurricane Maria bore down on the already distraught Floridian populous causing continued damages. While those two category five hurricanes decimated the southeast United States the category four Hurricane Harvey tore into Texas, annihilating homes and land causing mass flooding on August 29. In addition, Hurricane Nate made landfall on October 8, causing flooding throughout eastern Mississipi. Events like these will continue to occur with higher frequency as climate change continues to affect water levels and temperatures, ocean currents and wind currents. The resulting erratic weather patterns and weather anomalies could cause intense and potentially irreparable damage to our world’s people and infrastructure. I know it is difficult to wrap one’s head around, given Oregon rarely experiences events similar to these, but the reality is that as climate change worsens, there is no telling what storms could materialize. In further harrowing news, early this September, Mexico was hit by two massive earthquakes. The first earthquake, which measured in at a magnitude of 8, struck off Mexico’s coast and did minimal damage. The second earthquake, which weighed in at a magnitude of 7.1, did massive damage to Mexico City. The earthquake toppled buildings, cracked roads and killed hundreds of people. Though events like this seem rare, they aren’t uncommon in seismically active regions like Mexico which reside next to the Pacific Ring of Fire, according to Behzad Fatahi, a professor at the University of Technology in Sydney. This calamity acts as a grim reminder to the residents of Oregon that the Cascadia subduction zone, a “megathrust” fault is a 1,000 Km long dipping fault that stretches from Northern Vancouver Island to Cape Mendocino California, could be set off causing an earthquake of magnitude 8.5 or higher. On that note sleep tight knowing that at any minute the ground could open up beneath you and swallow you whole. I personally find the possibility terrifying but the fact that I have no power over whether Gaia eats me like Halloween candy keeps me from losing too much sleep. 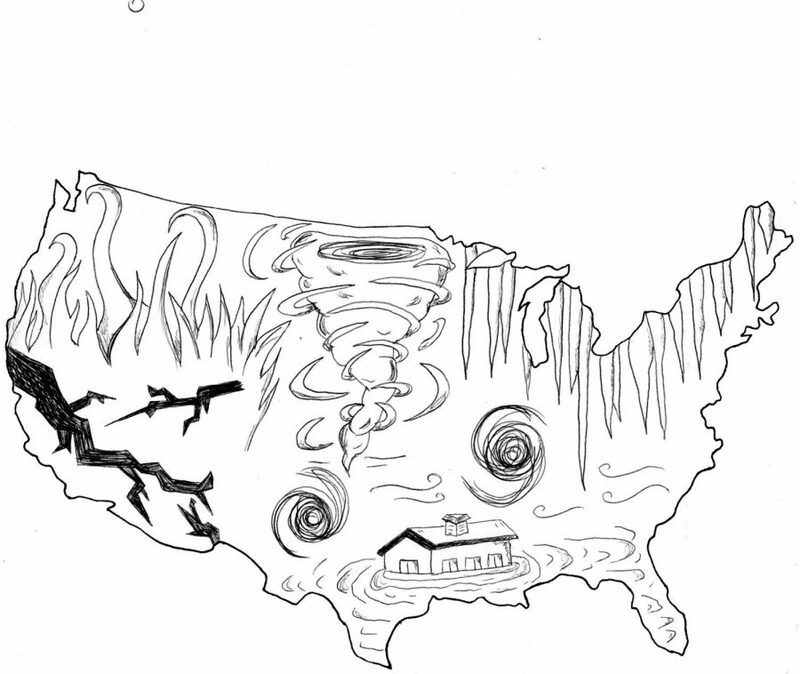 In conclusion, the Northwest is descending into a fiery inferno, most of the United States’ south is being pummeled by hurricanes, and the majority of the West Coast could fall into the ocean when the massive fault line running along Oregon decides to shift. It is also important to note that Ashland High School’s Humanities building is not up to code, and has a “hundred percent collapsibility potential under an instance of a high magnitude earthquake” as reported by Rogue News in 2016, so when the earthquake hits, being in Math class could be your downfall. Unfortunately, the news world seems to have forgotten the inherent aspect of natural disasters: they are natural. I believe it is important to recognize the tragedy and the calamity that has been occurring with greater frequency in recent months but allowing deafening panic to drown out practicality is counterproductive at best. Many of the disasters that occur do so because the human race has chosen to disregard the impacts of the ways we gain energy and more generally treat our earth. So the next time disaster strikes, look for solutions and don’t let yourself get swept up in the noise. We aren’t to mass extinction yet. We are not modern day Dinosaurs waiting to be crushed at the hands of an angry god raining meteors down on us from the sky. We have the ability to undo what our predecessors have done and save our Earth.